As I mentioned in my recap of my first week’s return to running, I need a GPS watch to run around here, and probably anywhere if I want to analyze my splits and figure out exactly how I should be pacing myself. I am happy to announce that I FINALLY GOT ONE! This seems like it might be an easy thing to do. A company with a bunch of different watches should have some information published that directly compares and explains all different features of each watch to make your decision clear. Garmin does not. I knew I wanted to be able to program speed workouts into it, and I wanted it to tell me how far I have run, my current pace, and my overall time running. I wanted to be able to see where I went on a map to roughly plan future routes, and I wanted to see my splits. When i was looking through all the different watches, there were so many features it made my head spin. Some watches vibrated when you reached your target heart rate (as programmed by you), some allowed you to race yourself from previous runs on the same route, some would navigate you back to your starting point, some had touch screens or touch bezels…the bells and whistles never end! I went to Varsity Sports with the idea that a Forerunner 410 might be what I wanted, but I got the idea that I wasn’t being taken seriously. The one woman who was really working with me tried her darndest to help me out, but didn’t know much about the newer models. Another woman, who gives the impression that she is damn good at running and doesn’t think anyone else is really worth much effort (even though she works in retail…I see a disconnect here!) didn’t really tell me much except that they sell a lot of 210s and that she is very tech savvy so she runs with a more advanced model. I left empty-handed. This left me with the internet as my guide, and I found that the reviews on DC Rainmaker were incredibly helpful. 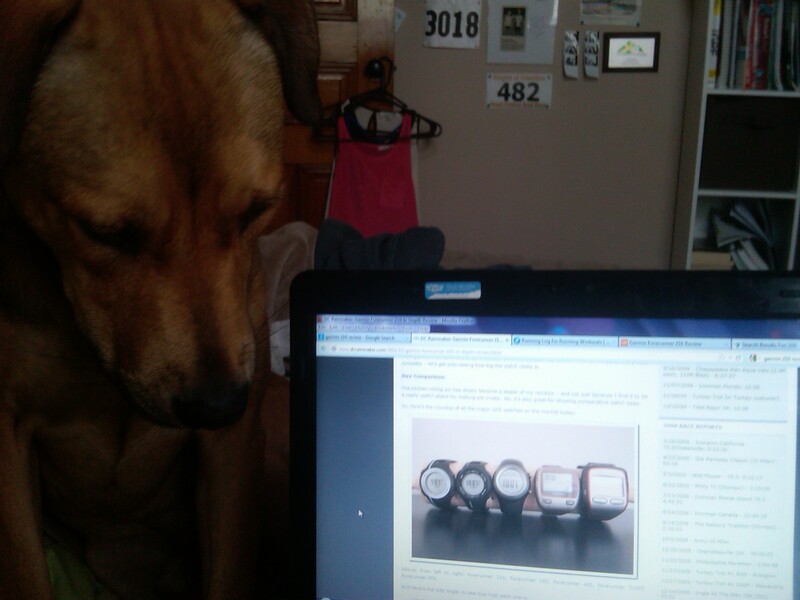 With help from this website and my trusty pup Louie, I got down to business. I began to lean towards the Garmin Forerunner 210, and when I found out that there is a student athlete rebate, I was convinced. This is my watch! Unfortunately, I figured it out on a Sunday when Varsity wasn’t open. Monday afternoon I bought it, scored 10% off for my employment at Hour Blast, and immediately charged that baby up. Now I’m about to go for my first run – I’ll report back later! This entry was posted in Running and tagged Garmin, Garmin Forerunner 210, GPS watches, running watches. Bookmark the permalink. Thanks for posting this! Ive started looking into new GPS watches and the rebate is perfect.